How to Convert Kiki’s Delivery Service Blu-Ray Disc? For animation movie fans, Kiki’s Delivery Service is no doubt a forever wonderful and beautiful animated movie to watch and collect. The good news is that Kiki’s Delivery Service is now available in HD Blu-ray disc. People could now watch HD version of Kiki’s Delivery Service movie with home Blu-ray disc player. To help you better store your Kiki’s Delivery Service Blu-ray disc, if you ever get one, this guide offers you a wonderful solution to backup your Kiki’s Delivery Service Blu-ray disc. 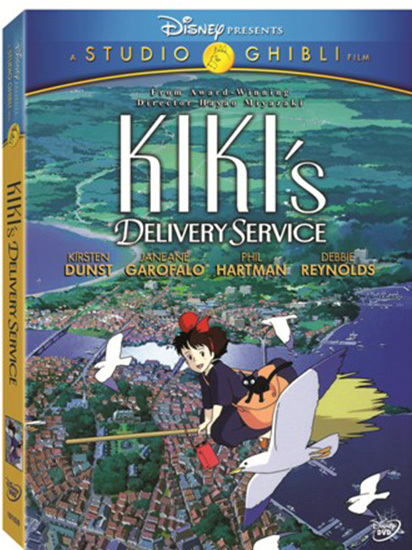 As a 1989 Japanese animated fantasy film produced by Studio Ghibli, Kiki’s Delivery Service adapts the 1985 novel of the same name by Eiko Kadono, and it tells the story of a young witch, Kiki, who moves to a new town and uses her flying ability to earn a living. Kiki’s Delivery Service was released in Japan on July 29, 1989, and won the Animage Anime Grand Prix prize. It was the first Studio Ghibli film released under the distribution partnership between The Walt Disney Company and Studio Ghibli; Walt Disney Pictures recorded an English dub in 1997, which premiered in United States theaters at the Seattle International Film Festival on May 23, 1998. The film was released on home video in the U.S. and Canada on September 1, 1998. You could use Leawo Blu-ray Ripper to convert and rip Kiki’s Delivery Service Blu-ray disc to your computer so as to avoid using the Blu-ray disc frequently, which might result in disc scratch or damage. Leawo Blu-ray Ripper could help you convert and rip Kiki’s Delivery Service Blu-ray disc and at the same time retain the HD movie image of Kiki’s Delivery Service Blu-ray disc after conversion. It could convert Kiki’s Delivery Service Blu-ray disc to videos in HD formats like MKV, MTS, HD MP4, HD FLV, etc. The converted Kiki’s Delivery Service Blu-ray movie could be played back and enjoyed on any media player or portable device like QuickTime, Windows Media Player, iPad Air 2, Galaxy Note 4, Nexus 6, iPhone 6, etc. 3. Connect your computer with internet. Insert "Kiki’s Delivery Service" Blu-ray disc into the BD drive. On the main interface of Leawo Blu-ray Ripper, click "Add Blu-ray/DVD" button. This Blu-ray disc ripper would lead you to load Kiki’s Delivery Service Blu-ray movie from the BD drive. Three Blu-ray movie content loading modes are available: Full Movie, Main Movie and Custom Mode. You’re suggested to choose the Main Movie mode, as it will save much space for you and keep the main movie converted. Next to the "Add Blu-ray/DVD" button, there is a drop-down box named “MP4 Video” by default; click the box, and select "Change" option. On the popup Profile window, select desired format from "Format" or "Device" group as output profile. This Blu-ray Ripper enables you to change the video and audio parameters of output profiles like video codec, audio codec, bit rate, aspect ratio, resolution, frame rate, channel, etc. You could click "Edit" option on the drop-down box to enter the Profile Settings panel to do this. Hit the green "Convert" button on the main interface. On the popup side bar, set "Save to" option and then click the "Convert" button to start converting. This Blu-ray Ripper would start to convert Kiki’s Delivery Service Blu-ray disc immediately. Afterwards, you could put the converted Blu-ray movies to any player or device for playback. You can also use Xilisoft Blu-ray Ripper to convert Kiki’s Delivery Service Blu-ray Disc to SD and HD video formats such as MKV, AVI, WMV, TS, etc. Download, install and launch Xilisoft Blu-ray Ripper on your computer. Insert Kiki’s Delivery Service Blu-ray disc into computer’s Blu-ray drive, and click Blu-ray disc icon on the sub-menu bar to load Blu-ray disc. Select Blu-ray title(s) that you want to rip, set your desired output profile and choose a destination folder to save the output file. Click “Convert” button on the sub menu bar at the top to begin Blu-ray disc ripping process. According to the comparison chart, it is safe to conclude that Leawo Blu-ray Ripper and Xilisoft Blu-ray Ripper have almost excatly the same features. However, if you want to rip commercial or encrypted Blu-ray discs, Xilisoft Blu-ray Ripper is ruled out, and you should make good use of Leawo Blu-ray Ripper in that case.